5 minutes, numerous police cars and a large black car with tinted windows swept past. In the back was sitting a very elegant woman: Nancy Reagan. She looked at me and waved. She became very well known for her anti drug crusade but she made a significant impact on the lives of many women before then. In 1987, she developed breast cancer and was treated with a mastectomy. At the time of diagnosis, she apparently said, "I guess it is my turn". She was referring to the fact that the former first lady, Betty Ford, had also had breast cancer. 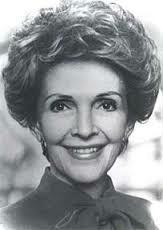 Mrs Reagan was open about her diagnosis and encouraged women to visit their doctors for a breast examination. No formal screening programme was in place at the time. A study done shortly after her diagnosis showed that 65 of women in the area sampled had seen a health professional for a breast examination. She was one of the first advocates for breast screening and many women who are breast cancer survivors today can thank her for her public stance.